It’s great to be immersed in all things open at Creative Commons. My colleagues are very tapped in to open efforts around the world and a steady stream of news and developments flow across my screen every day. Actually steady stream is an understatement – it’s like drinking from a firehose. Let me share with you a few of those sips. Open Textbooks are hot. At a time of economic and financial constraint with students are taking on more and more debt it’s worth seeking solutions that save governments and students money. There is an economic argument for open. Why Pay for Intro Textbooks? The Saylor Foundation’s Open Textbook Challenge Wave I Winners were announced. Saylor open textbooks are now available on their Saylor iTunes site and via sites like Good Semester. In late September California Governor Jerry Brown signed two bills that provide for the creation of free, openly licensed digital textbooks for the 50 most popular lower-division college courses offered by California colleges. The textbooks developed will be made available under the Creative Commons Attribution license (CC BY) allowing others to use, distribute, and create derivative works based upon the digital material while still allowing the authors or creators to receive credit for their efforts. 20 Million Minds created a fascinating info graphic Embracing the Future: Free College Textbooks showing the benefits associated with this initiative. Turning up the heat the Association of American Publishers put out a This Road to “Free” is Paved with Misinformation news release and AAP’s Roadmap to Misleading Infographics giving their analysis of the 20 Million Minds infographic. Leading to the PR Newswire story Publishers announce roadblocks to CA’s Open Road to Free College Textbooks where 20 Million Minds replies. Clearly the publishing industry is in the midst of change similar to that of movies and music. I’m amazed that the publishing industry does not see open as an incredible business opportunity. The publishing industry’s historical role is to select expertise, support content creation which they then vet, edit and assemble into well designed, engaging formats, with high production values which they then market, sell and distribute. The publishing industry is being handed a gift – millions and millions of dollars of vetted high quality content available to them to freely use for business purposes. Sure this is a disintermediation of parts of the publishing industry supply chain. However, there is still a huge need for the curating, assembling, designing, creating engaging activities around content, and the assembly of content into formats that are then marketed, sold and distributed. I’d like to see the publishing industry stop bemoaning their fate and be less adversarial to these innovations. The publishing industry has a huge opportunity in front of them and ought to embrace the greater diversity of expertise being made available to them for free and innovate new forms of publishing that better support market needs. In the K-12 space open textbooks are emerging in a slightly different context. 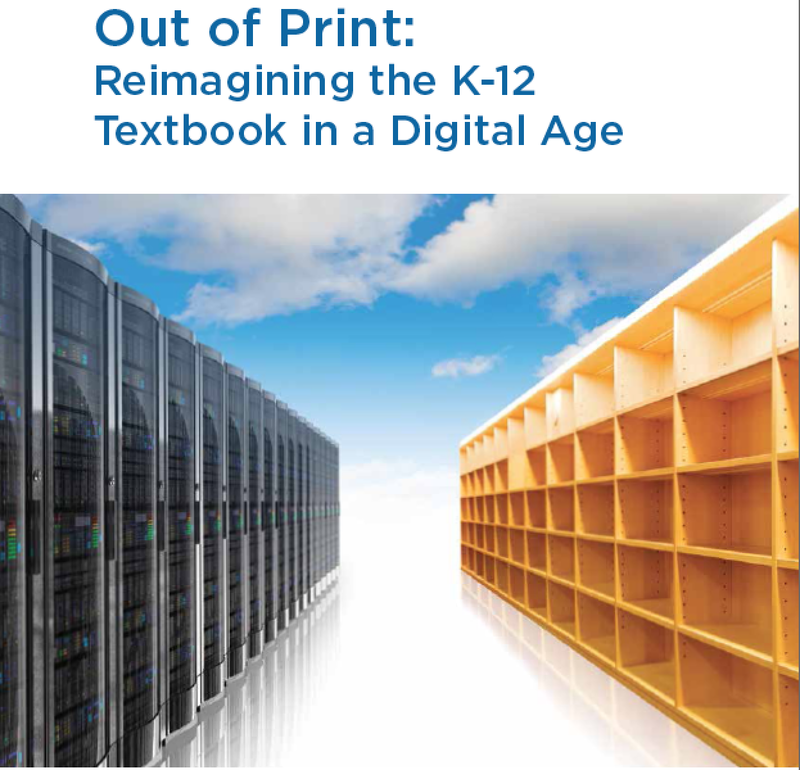 In Sept 2012 the State Educational Technology Director’s Association (SEDTA) released Out of Print: Reimagining the K-12 Textbook in a Digital Age. This fascinating report describes how digital formats impact student learning and engagement and support personalized learning. Profiles of how different States are adopting digital policy and practices are outlined including initiatives that seek an approach that modular, flexible digital resources that don’t lock the entire class into a rigid sequential learning structure. In K-12 there is the potential, especially around Common Core curriculum to develop new digital resources that are used for subjects like Math and English Language Arts across many states. And open textbooks aren’t just happening in the US other parts of the world are making similar initiatives. See Digital School program with open textbooks approved by Polish government! for a European example. This past summer has seen a flurry of activity around MOOC’s as new education initiatives like Coursera, EdX, Udacity and others seek to reach thousands of learners by providing free access to education. Consider this ambition for large class sizes against long traditions of strike action by teachers over class sizes and enrollment limiting practices – proximity, marks, and money. For me MOOC’s are a form of open pedagogy and I found George Siemens’ MOOCs are really a platform of interest for the way it differentiated connectivist cMOOCs from the newly emerged xMOOCs. While both MOOC types provide free access cMOOCs emphasize creation, creativity, autonomy, and social networked learning while xMOOCs emphasize a more traditional learning approach through video presentations and short quizzes and testing. As George puts it “cMOOCs focus on knowledge creation and generation whereas xMOOCs focus on knowledge duplication”. MOOC’s have generated a slew of analysis and critique related not just to pedagogy but to credentialing (here, here, and here for example), and completion rates (here and here for example). In September 2012 Sir John Daniel, during his time as a Fellow at the Korea National Open University (KNOU), wrote a research paper Making Sense of MOOCs: Musings in a Maze of Myth, Paradox and Possibility. In this paper Sir John examines the state of MOOCs today across a range of dimensions. Sir John makes a number of wonderfully provocative observations particularly around credentialing where he notes the MOOC dilemma that what decides whether or not a student can obtain a degree is determined not by their mastery of the courses, but by the admissions process to the university, which he calls “untenable nonsense”. A little over a year ago Scott Young set himself a challenge. He committed to learn the entire 4-year MIT curriculum for computer science, without taking any classes. How is this possible? Well Scott tapped in to MIT’s OpenCourseware. You can see the rules he set for himself and his learning progress here. 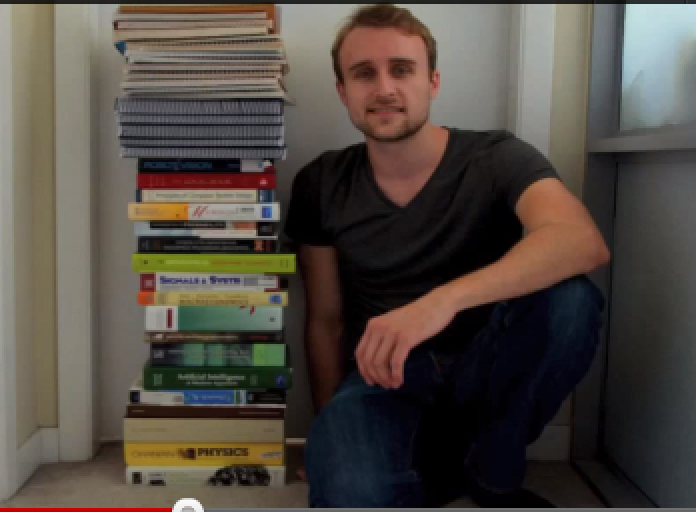 On September 26, 2012 after 11 months and 26 days Scott finished the last project and exam for the MIT Challenge. Over that period of time he completed 33 courses including passing final exams and completing the programming projects. Check out The MIT Challenge is Complete to hear his summary of what he learned. Given the discussion around the MOOC credentialing it is interesting to contemplate whether Scott should receive or even wants some certification/credential recognition from MIT. When it comes to learners engaging in study using Open Educational Resources and formally receiving academic credit for their accomplishments the OERu and its growing list of academic partners are leading the way. I expect the OERu will be the first to solve this conundrum in a way that works for students around the world. Scott Young’s story is an interesting example of someone pursuing personal and professional development through intensive immersion in open educational resources. Here’s another story of someone setting themselves a year long open challenge. 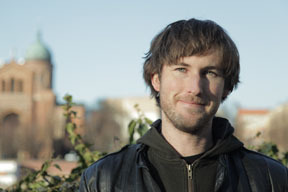 As described in his press release, Berlin-based filmmaker Sam Muirhead is abandoning all copyrighted products and switching to open source software, hardware, and services for one year, as the subject of his own series of online documentary videos. He aims to raise awareness of open source projects and methods, and get people from outside the tech world interested and involved in Open Source. Over the course of his year of open source Muirhead will make his own Open Source shoes, jeans, toothbrush and furniture (and release the designs for others). He’ll be using Open Source educational methods to learn Turkish, avoiding food grown from copyrighted seed strains, and abandoning Apple software. I like this expansive and comprehensive list of the way open is manifesting itself and impacting so many dimensions of society and culture. On October 3-5, 2012 Creative Commons hosted a convening of open experts from around the world on an Open Policy Institute and School of Open. I was fortunate enough to be a participant along with colleagues from a range of organizations such as Mozilla, Wikimedia, OECD, SPARC, FSF, OKFN, P2PU, OCWC, and others. Thought people might find these initiatives of interest so here’s a snippet about each. “Open policy advocacy efforts are generally tied to specific institutions or bodies of government, and as a result are decentralized and disconnected from similar initiatives. Moreover, there is little emphasis on sharing knowledge between these entities, despite their common goals. Institutions and governments around the world frequently reach out to Creative Commons, seeking assistance to develop strategies to increase the adoption of open policies. The need for support and leadership around open policies was amplified at Creative Commons’ 2011 Global Summit, when affiliates from 35 countries called for a central hub where open policies could be shared and discussed. Input into the Open Policy from participants was wide and deep. While much work remains to be done it’s clear the Open Policy Institute will bring together best practices, policy models, effective strategies and resources to help governments, institutions and advocates make the case for why and how to implement open policies. Two repositories of open policy already exist. The ROARMAP is a registry of open access policy and the Open Educational Resources (OER) Policy Registry, is a database of current and proposed open education policies from around the world. I’d even like to suggest there is policy that can be adopted at the individual level, but then your target audience starts to include everyone. However, there is a tendency to see policy as the responsibility of government only. By providing policy for a broad target audience we can empower all entities no matter what level to take some initiative around policy. This creates a scenario where policy is happening top down, bottom up, and diagonally at the same time. “The School of Open will provide online educational resources and professional development courses on the meaning and impact of “openness” in the digital age and its benefit to creative endeavors, education, research, and beyond. Individuals and organizations will learn how to use free technology and tools, such as Creative Commons licenses, to achieve their goals. Participants will also learn how to overcome barriers they run into everyday due to legal or technical restrictions. Universal access to and participation in research, education, and culture is made possible by openness, but not enough people know what it means or how to take advantage of it. We hear about Open Source Software, Open Educational Resources, and Open Access… But what are these movements, who are their communities, and how do they work? Most importantly—how can they help me? Big thanks need to go out to the international participants who all contributed great ideas for the future development and enhancement of the Open Policy Institute and the School of Open. Before I left BCcampus to join Creative Commons I helped relaunch the Creative Commons Canada Affiliate. I’m thrilled to see the Creative Commons Canada web site launch and look forward to participating in the Creative Commons Salon Vancouver – October 15th featuring a panel of practicing artists who will share how and why they chose to use Creative Commons licenses for their works including a discussion on the changing landscape of creative practice, intellectual property and participatory culture. This event if free and open to anyone interested in attending. Hope to see you there! In addition to some outstanding keynotes this year we’re trying a couple of experiments – the Remixathon and the Pitchfest. 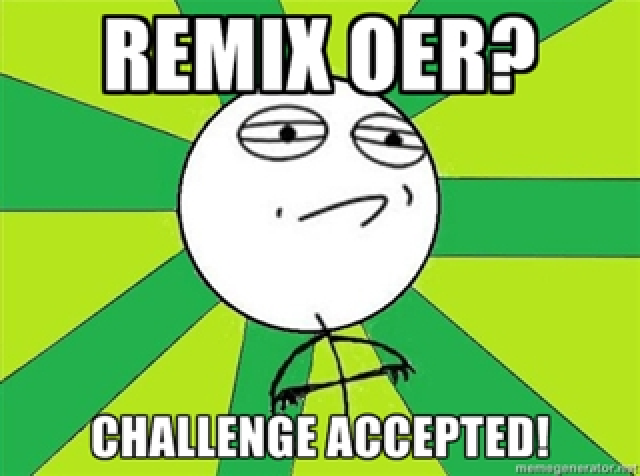 The Remixathon brings focus to a relatively untapped aspect of OER – the fact that open licenses allow for remixing and creation of derivative works. We thought it might be interesting in the spirit of hackathons to organize a remixathon. Conference attendees were asked to submit OER for the opportunity to be remixed. We got lots of great submissions so from October 12 through Oct 18 we’re hosting a remixathon in SCoPE. The remixathon kicks off with a Blackboard Collaborate webinar where each person who submitted OER describes the resource along with envisioned enhancements. The SCoPE discussion forums will allow face-to-face and virtual participants to discuss and share enhancements over the ensuing week. We’ll showcase the before and after OER on the last day of the conference. The Pitchfest idea is similar to that of someone making a pitch to venture capitalists (think SharkTank or Dragon’s Den). The basic idea is that many people are looking for others to adopt, utilize or otherwise invest social or financial capital in their Open Education initiative. At 3:45pm on Tuesday October 16th at the Open Education conference people representing projects, companies and ideas will have 4-5 minutes a piece to make their best pitch to the audience. You can see a list of who is making a pitch and what their pitch is about here. To cap it all off this years Open Education Conference is having an OpenEd12 Jamcamp on a special boat cruise we’ve organized. I’m expecting to shake a leg and maybe even sing or play. I’d love to be the brass section for this bunch – where is my old trumpet anyway? 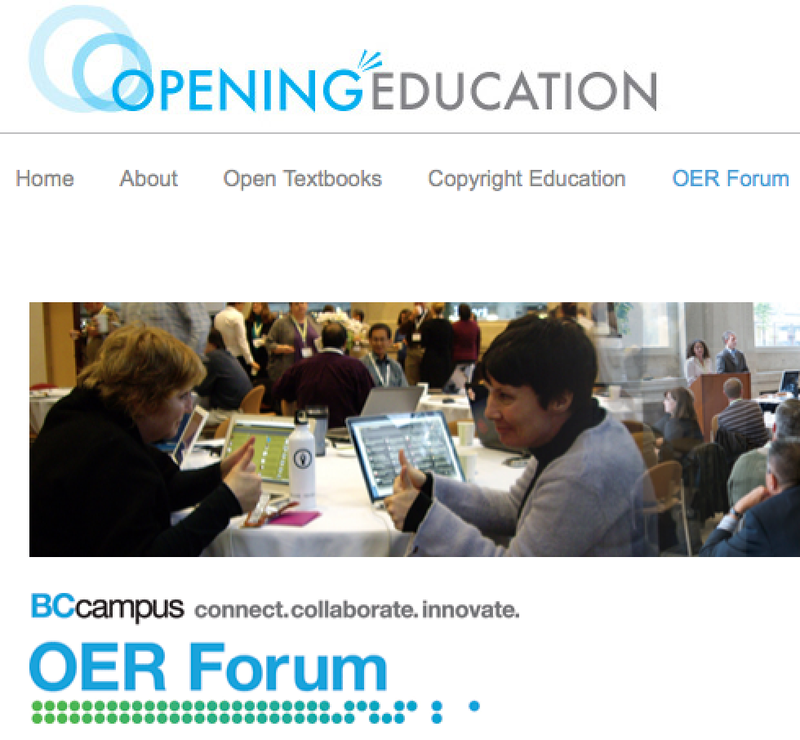 I’m proud to be facilitating the BCcampus OER Forum for senior BC post-secondary institution representatives in Vancouver on the afternoon of October 18, 2012. The objectives of the session are to develop a common understanding of what OER could mean for BC and build a shared vision of how to develop and use them. The session will also consider ways BC can take advantage of the promise of open educational resources and open textbooks. Having worked on open initiatives at BCcampus from 2003-2012 prior to joining Creative Commons I really hope that this event builds out a strong interest and direction. We’ve organized a fantastic key speaker (David Wiley) and panel (Alan Davis, Cable Green, Brian Lamb) asking them all to suggest “action plans” for BC. The BCcampus OER Forum is a wonderful opportunity to put on the table real action plans for institutions, heads of teaching and learning centres, VP’s/Presidents, and government. Action can be small or big, policy or practice, cost or no-cost. Action can be something an institution pursues autonomously or done in collaboration with others across the BC system and globally. This event provides us with the opportunity to move BC forward so hearing action plan recommendations will be very helpful for the Ministry, for institutions, and for BCcampus. Can’t wait to see what emerges. For me, across these events, open is a gathering force. Not just in education. I sense a greater strength in breadth of impact across cities, design, culture, research, democracy, journalism, and business. Perhaps not a fire hose, a rising tide?